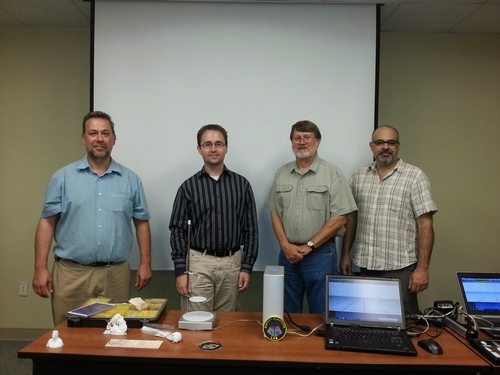 The week beginning August 4, 2014 found me at the Research Laboratories of Archaeology (RLA) at the University of North Carolina-Chapel Hill. 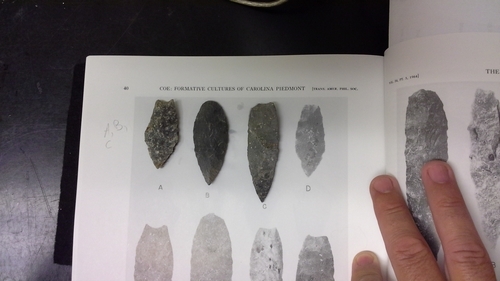 For my current Department of Defense (DoD) Legacy Program project, my efforts focused on scanning diagnostic chipped stone tools illustrated by Joffre Lanning Coe in his 1964 The Formative Cultures of the Carolina Piedmont. 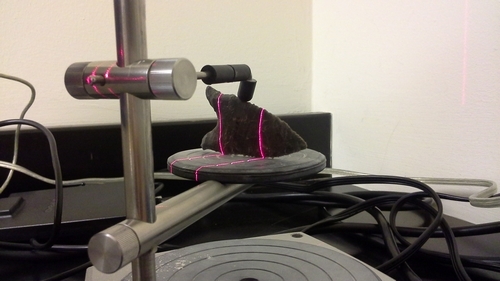 As was true for my recent work at the New York State Museum, where I scanned diagnostic chipped stone tools used by Ritchie in his typology (see here), my basic goal was to create digital models of as many of the points used by Coe as possible. 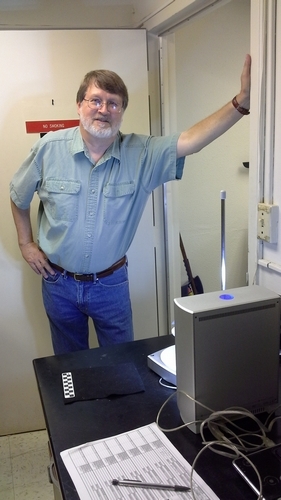 I was greatly facilitated in my efforts by RLA’s Steve Davis, who not only provided me with all the points I could scan (and more) organized by type in Riker mounts, but also made available the RLA’s newly purchased NextEngine Desktop 3D scanner. 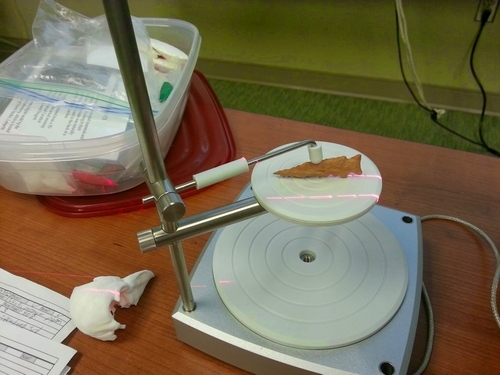 This scanner is one that I was consulted upon regarding its utility for archaeological purposes, and a guide that Ashley McCuistion, Courtney Bowles, Clinton King, and myself developed is kept on hand to guide the users of RLA’s scanner. 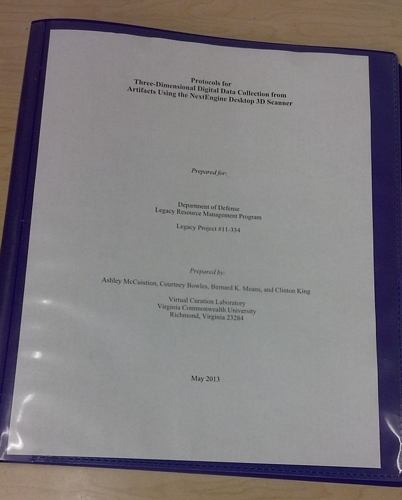 This guide can be found in the back of our technical report on our first DoD Legacy Project. 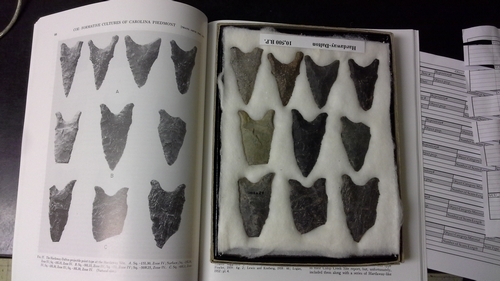 The diagnostic chipped stone tools that I scanned from Coe’s Formative Cultures volume included the following from the Doerschuk site: Stanly Stemmed, Morrow Mountain I and II stemmed, Guilford Lanceolate, Savannah River stemmed, Badin Crude Triangular, Yadkin Large Triangular, Caraway Triangular, and Pee Dee Triangular. 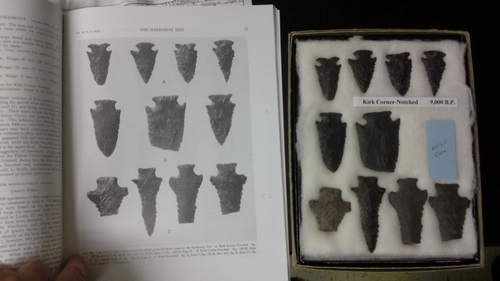 From the Hardaway site, I scanned: Hardaway Blade, Hardaway-Dalton, Hardaway Side-Notched, Palmer Corner-Notched, Kirk Corner-Notched, Kirk Serrated, and Kirk Stemmed points. Finally, I scanned Halifax points from the Gaston Site. 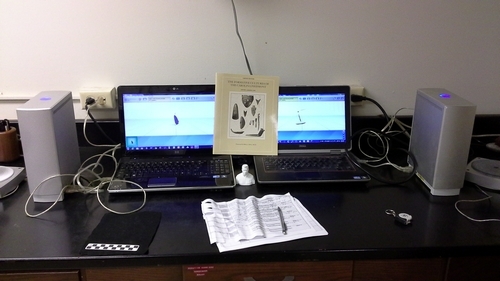 Using two scanners simultaneously was challenging for one individual, but I was able to scan two and in some cases three representatives of almost every point. 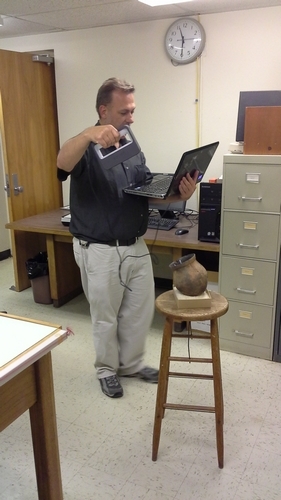 I also demonstrated the Sense 3D scanner while at RLA, and RLA staff were impressed with its ability to record feature details, as well as the basic morphology of a Catawba pot. Photograph courtesy of Danianne Mizzy. 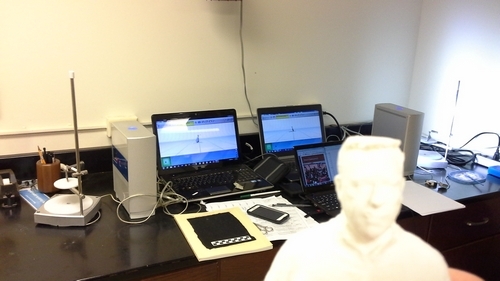 I briefly discussed the overall operation of the Virtual Curation Laboratory, and discussed our applications of the NextEngine Desktop 3D scanner and the Sense 3D scanner, as well as the MakerBot Replicator Mini. 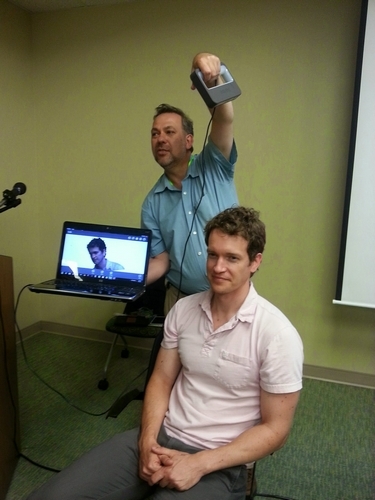 I demonstrated the NextEngine Desktop 3D scanner that I brought by scanning an Anatolian lion scapula, an extinct species, made available by Ben Arbuckle, who is an anthropology faculty member at UNC-CH. 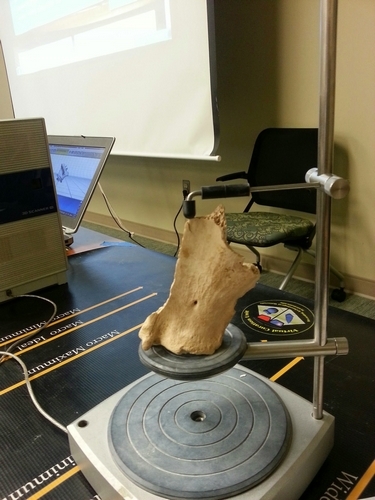 The RLA’s NextEngine Desktop 3D scanner was used to record morphological details from a Palmer Side-Notched point provided by Steve Davis that was surface collected in South Carolina. 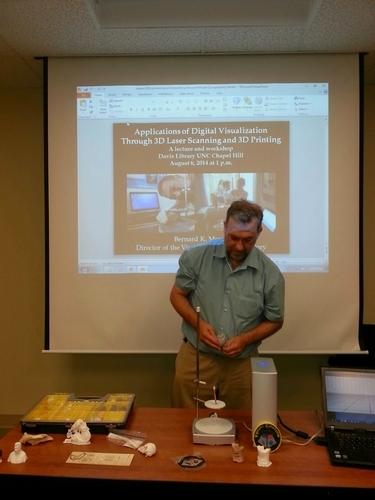 The Sense 3D scanner proved popular, and I scanned a number of the workshop attendees, who came from a variety of disciplines at UNC-CH. One of these individuals was Ben Arbuckle. 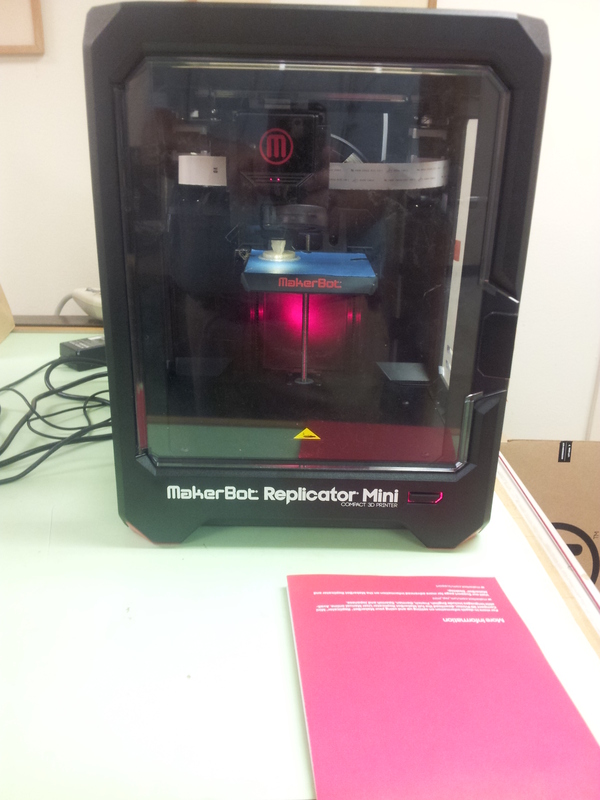 The MakerBot Mini I brought was used to print a scaled-down version of the Catawba pot I had scanned earlier that week. Overall, this was a very productive research trip, and I find the questions that people ask me at workshop events crucial to honing my own thoughts, as well as how I approach scanning of varying objects. 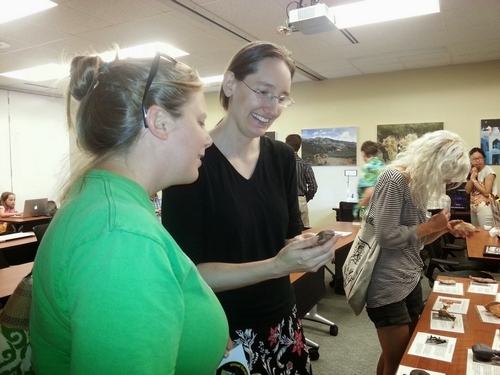 I certainly look forward to a return visit to the RLA, probably during the semester with students in tow.